A federal judge has delayed the sentencing of three men who plotted to bomb a mosque and apartment complex housing Somali refugees in Kansas. U.S. District Judge Eric Melgren on Monday reset the sentencing date to Sept. 6 for Patrick Stein, Gavin Wright and Curtis Allen. The case had been scheduled for sentencing next month, but some defense attorneys asked for more time in part to prepare for it. The men were convicted in April of one count of conspiracy to use a weapon of mass destruction and one count of conspiracy against civil rights. Wright was also convicted of lying to the FBI. 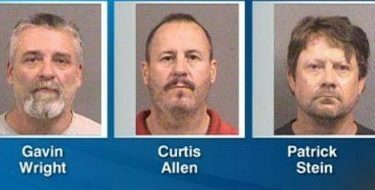 They were indicted in October 2016 for an attack planned for the day after the presidential election in Garden City.